A California Fruit Express refrigerator car awaits loading at the new San Joaquin Fruit Growers' Association packing plant. The San Joaquin Fruit Growers' Association packing house in Holden is now complete and occupied in Holden. Refrigerator cars ship daily with apples, grapefruit and other produce. In other words, I have completed another structure for this town. It started life as a Walthers packing house kit. 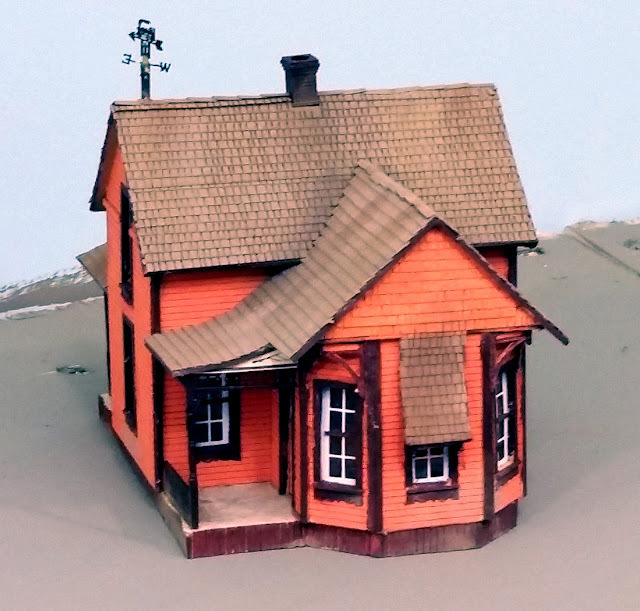 Usually, I don't use standard kits, not because they are not good, but because they seldom look like structures in the part of the country I am modeling. In this case, the Walthers kit looked like a frame packing house would like in the 1890s. The kit was assembled per the instructions with little being done. The signs for the building were custom printed. The stacks of fruit crates were constructed by wrapping wooden blocks with a printed wrapper showing stacks of fruit crates. 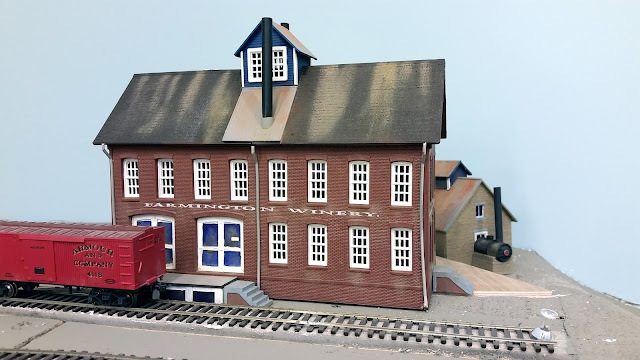 This was done by first selecting end labels which appealed to me (there are numerous photos of these labels on line) and then reducing the image to HO scale. The label was then duplicated in a stack-like formation. The same thing was done for the sides of the crates and the top. These images were organized to form a wrapper which glued to the wood block. The individual crates were obtained from Shapeways (https://www.shapeways.com/product/X7NBJNAAQ/orange-shipping-crate-set-ho-no-lids?optionId=59187209&li=user-wishlist). They come in both open top and closed top configurations. 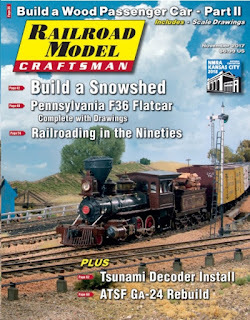 With the NMRA convention coming up in Kansas City this summer, both Railroad Model Craftsman and Model Railroad Hobbyist are doing their part to publicize the event. 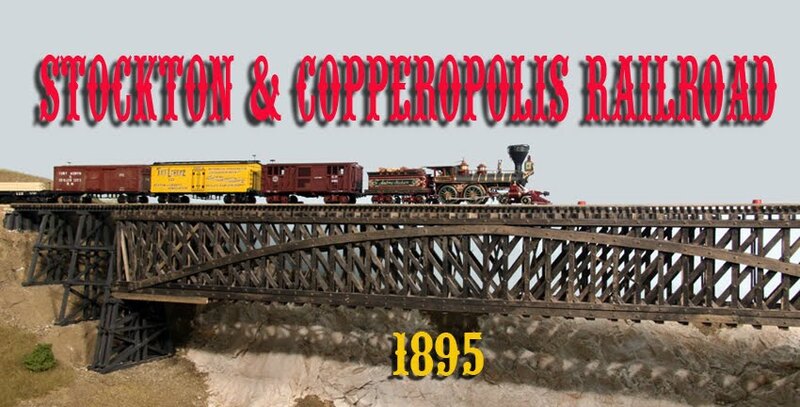 As many of you may know, the Stockton & Copperopolis has been featured in both publications recently: the November 2017 issue of RMC and the March 2018 MRH. Both RMC and MRH did a real good job of showing off the railroad and Trainmasters was no exception. 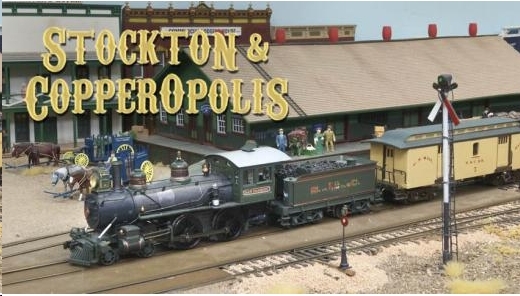 The 23-minute production covered a great deal of the railroad and even made me look halfway decent. My thanks to Barry and my frequent operator, Mark Davidson, who spent the day helping me during the filming. For those of you thinking of coming to the convention, it looks like it's going to be a good event. The people in charge are working hard to make sure that of its success. 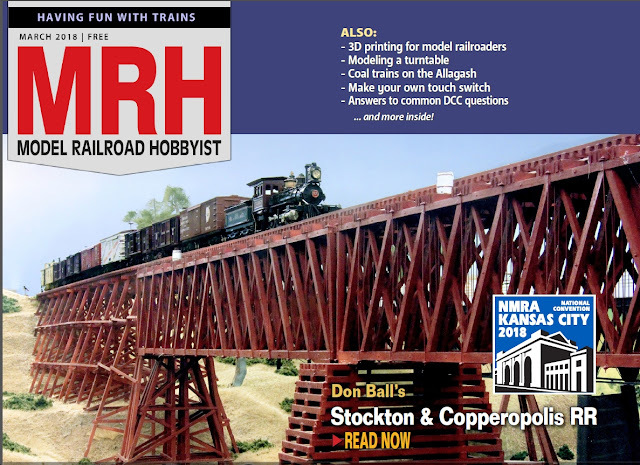 If you don't read it already, check out Model Railroad Hobbyist. Joe Fugate does an excellent job and there is a heavy emphasis on photos to tell the story. The best part is that it's free. 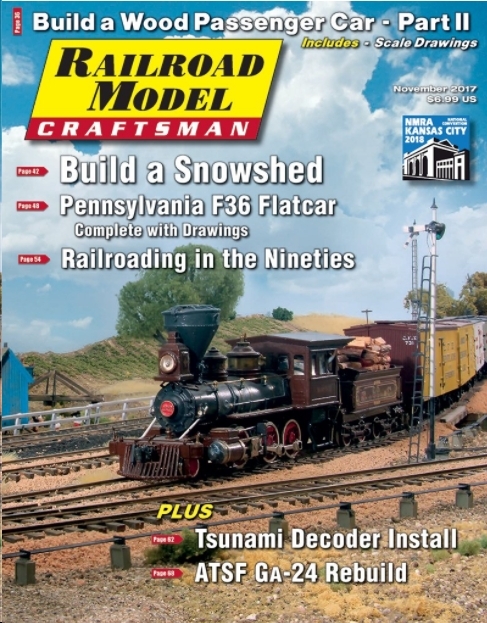 Trainmasters, however, is a subscription service but there are many, many videos of layout visits and how-to-do-it subjects. I've only seen a couple but they are very professionally done. It seems well worth the price. Two weeks ago, Kansas City hosted its bi-annual Prairie Rail event. This is an invitational operating weekend where railroaders congregate from all over the country to operate four railroads during the three days. 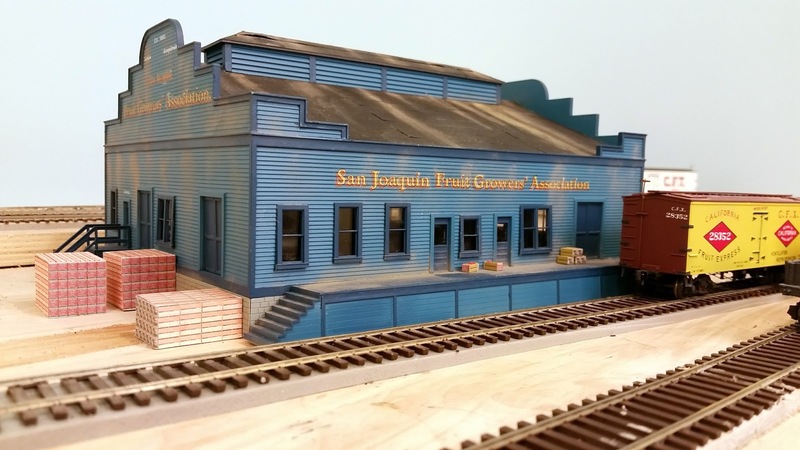 This year, we had over 150 attendees operating on over 30 model railroads. The Stockton & Copperopolis was privileged to host two sessions with ten operators each. Fortunately, the railroad behaved and everybody seemed to be having a good time. Only minor problems came up and were easily solved. I heard nothing but good comments about the event in general. The Farmington Winery sits at the end of a spur at the edge of Little John Creek. The boiler house is in the rear. I still need to add some wine barrels and a vat or two around the outside. I will do that when I do the final mounting and scenery work. In the leadup to the event, everything was cleaned and checked but no new work was done for fear that some new problem would arise. In this period of limbo, I literally dusted off a kit I had been saving for over 20 years and decided to assemble it. The Farmington Winery was born! The basic kit was a Railway Design Associates mill which looked very much like some of the old California wineries. Not much in the way of modifications was done as it looked good the way it was. The California Models cottage. The weather vane was added from an etched kit I had been saving. The house will sit on the other side of the tracks from the depot near the main town district. During the same time period, I finished another kit started several months back. It was an early kit with a lot of wood and paper details (no nifty Grandt Line castings here). It is going to be in the background so any lack of detail would not be noticed anyway. It turned out all right but the modern laser kits are more the way to go.